High performance 3D data fusion, combining multiple views with maps/imagery, sonar, laser, camera and other data you may collect. The full range of forward-looking sonar, multi-beam sonar, cable/pipe tracker and LiDAR options known from EIVA’s high-end 3D pipeline and cable route inspection package. 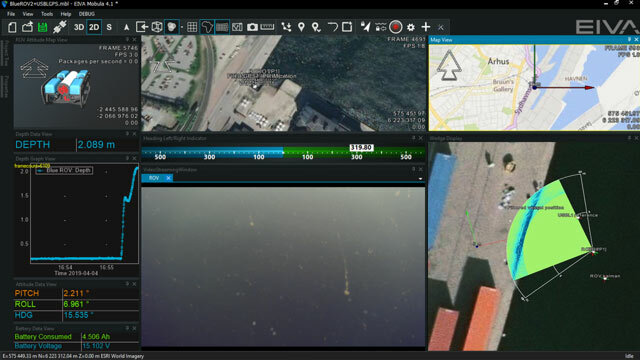 Positioning using a wide range of sensors enabling go-to-waypoint and follow-route features. A full package for professional inspection, registering events of interest. Connection to remote displays, allowing you to follow an inspection. NaviModel Free Viewer for your end clients to receive and fly through your inspection results. 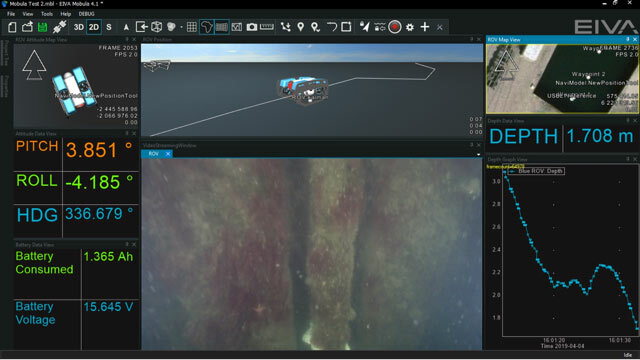 Moreover, EIVA is currently working on including its unique VSLAM algorithm in the software, letting you generate colour point clouds and 3D mesh models of the seabed and of subsea structures – just using the single camera on your ROV. EIVA’s long-term vision with NaviSuite Mobula is to provide a software package that enables fully automated inspections through a long list of advanced features. For this reason, NaviSuite Mobula includes functionality to steer the ROV – because it’s necessary for the automation features coming later. EIVA has initially focused on some of the most widely sold mini-ROV types in the market, namely the VideoRay Pro 4/Pro 5/Defender and the Blue Robotics BlueROV2, and NaviSuite Mobula is available in versions tailored to these ROV types. EIVA expects to expand the list of supported ROVs soon, as well as add more functionalities. EIVA is a Danish engineering company with over 40 years’ experience in development and delivery of solutions to offshore and shallow water engineering and survey industries. The company provides software, equipment, and integrated system solutions to maritime players around the world, delivering proven and reliable tools to support everything from underwater exploration, oceanography and hydrographic surveying to offshore construction, cable laying, dredging and rig operations.